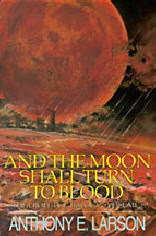 A few posts back I mentioned in passing the 'Prophecy Trilogy' books of Anthony E. Larson. Mr. Larson and I have begun a correspondence that has included discussion of his books, publishing in the LDS market, and the idea of 'strange doctrine'. He didn't call it that but I do. It's strange because it is not something that is taught in Sunday School, Priesthood or Relief Society classes. It is certainly not something you will find in a Primary manual (or is it?). In other words, what Mr Larson writes about is, doctrinally speaking, college level stuff. Does that mean that it is not something we should study? Of course not. The only problem is that most members of the church are still struggling with the doctrine that is in our official curriculum. However, as Mr Larson is very careful to point out, every bit of what he presents in his books was at one point taught by Joseph Smith, Brigham Young or other early prophets and apostles, backed up by scripture. Now, I know what you're thinking. When the anti-Mormons use some of the things that they find in the Journal of Discourses against us (Adam-God, blood atonement, etc), it has become standard practice to disclaim such quotes as having been taken out of context or misquoted by the scribes who, of course had to write everything out by hand without the help of electronic recording. Sometimes they got together to compare notes and make corrections but not always. So is the material that Mr. Larson uses reliable? I think so but you'll have to judge for yourself. If you've never read the opening chapter of his first book I urge you to do so. It is fascinating! He describes a day of dust - a strange reddish dust - that fell far and wide across America. With each passing day the dust became heavier until it turned to meteorites that pummelled the earth. Soon earthquakes and volcanic activity are being reported with increasing frequency. His opening chapter concludes, "We haven't seen the sun for days. Smoke and ashen clouds fill the sky, and the air get thicker by the hour. What is to become of us?" Sound like a fantastic tale? Think again. It's all foretold to happen and will happen. You and I may see this very scene come to pass in our lifetime, perhaps in the not too distant future. What follows in his book is an explanation of the events surrounding the destruction caused by this comet or passing planet. Mr. Larson presents scholarly research that has been the work of his lifetime and is well worth the investment of a few evenings to read. I remember when I read his first book that I could not put it down and read it from cover to cover in a few hours. At one time his books were more popular. Today, you might have to ask to find them in your local LDS bookstore or they might have to order them. Why is that? I'll leave that question to be discussed in another post. Have you ever heard of the Prophecy Trilogy or other works of Anthony E. Larson? If so, what do you think of his work? I have found few members of the church who have read his excellent books. I first came across Anthony Larson's books sometime in the 80's. I read the first one, but it was over my head. I again started reading the first book of the Trilogies in 1990 and couldn't put it down. I then ordered the other Trilogy books and everything else he has written and his video. The concept of his teachings were difficult for me but I started studying the Signs of the Times, The Last Days and Second Coming. I have finally in the last couple of years been able to understand. Mr. Larson's insight into the scriptures is amazing. I have tried to talk to other members of the church about his theories, but have never found anyone who was familiar with it. I believe that the "pioneer" members of the church were taught much of what he knows by Joseph Smith, but much of that has been lost. I am very grateful to Mr Larson for his willingness to teach out of the box inspite of what others think. He is truly amazing! I've written probably a half dozen essays over the years based on Anthony's stuff. You might want to visit my new blog at Latter-day Commentary. Search for and click on Anthony's name on the left-hand column of subjects. Thanks for leaving your comment on this essay and for visiting my blog. The Electric Universe - Fact or Fiction? Has the prophecy in Joel 2:31 been fulfilled? What kind of warnings do we prefer? Eschatology - The study of what? Article VI: Faith. Politics. America.